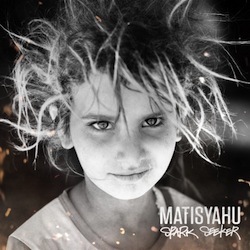 This is an excerpt from Matisyahu himself in a note to fans translating the almost boundless sounds rooted throughout his fourth studio album, “Spark Seeker”, set to release July 17, 2012. Although Matis (as he usually introduces himself) remains deeply grounded in familiar themes of truth, love, self and soul searching, the breadth of instruments and expansive origins of inspiration, layer by layer, track by track is an immeasurable feat of cohesive musical brilliance. Of course, defining Matisyahu simply by genre has long been an onerous process, and it’s quite avoidable by simply appreciating the acceptance that Matisyahu himself demonstrates in aspects of his own life. The message of universality, that we are all one, together in this life drives the pulse of the album and cements the successful fusion of sounds that explode from the speakers throughout “Spark Seeker”. The album opens up with Crossroads, an appropriate title for a song that begins to tell the story of a man’s evolutionary search within. Beginning with a Yiddish prayer song and fading out to the whispering sand winds, into the sounds of the sitar, you’re suddenly dropped in the desert, battling your inner-self, while Matisyahu applies the soundtrack to survival while you’re fighting for your soul, as well as moving your feet to the beat. Crossroads engages with the overall spirit of the album, it’s dark, yet strong and enlivening with the seriousness of the Matis message. You can feel the warmth of your heart from the initial beat move through your body and when seems to come to an end, he slams one more chorus for a prolonged fade out and fade in to the rest of the story to be told. It’s a powerful way to open Spark Seeker and excites the listener to hear what’s to come. During our first writing session together, Dave Holmes (guitarist from Dub Trio), (Kool) Kojak, and myself wrote and recorded "Sunshine". This was a totally different vibe from what I had been working on. More light hearted, beat driven, and sonically more of a Hip Hop sound then Rock. This created a conflict for me as to which project to work on first. A good conflict to have. Growing up going to Phish concerts and loving live music and at the same time listening to Hip Hop and beat driven music I have always had interest in live instrumentation but also digitally produced music as well. My records have always been a fusion but leaned more towards live instrumentation. I began to record with Kojak over the next year whenever I would be in LA and slowly but surely there were 2 songs then 3 then 6, etc. Up until this point it was a group of songs that were fun, beat driven head bangers, big synths, very melodic and hooky with classic Matisyahu themes running throughout. As tight as previous Matisyahu works have been, Kool Kojack’s influence adds a positive sheen over the tracks providing crisp, harder hitting bass notes and chorus lines throughout. Kojack is a multi-platinum writer/producer who has topped charts working with artists such as Flo Rida, Ke$ha, Nicki Manaj, Travis Barker, Katy Perry, Three 6 Mafia plus worked on Simon Cowell’s X Factor, an inclination to the edge he produces. It’s the concept of going back to find your inner child, seeking the spark. Finding the self which you left behind and going back and trying to reconnect. We (Matisyahu and Kojack) booked time at a studio in Tel Aviv and added a completely new direction to our music. We incorporated live Middle Eastern instrumentation. I can't even begin to explain to you the cast of characters that walked into that studio, but we have plenty of footage that I'll be sharing over the web as we get closer to the release. We recorded organic Middle Eastern sounds, wrote new songs and had some amazing special guests, all of which added a new depth to this record and took it to another direction completely. Over 10 days, with musicians cycling through, people playing their instruments for us, recording them on different songs, writing new songs, just great people all around and that’s the thing about Israel, that’s why I wanted to go there in the first place. Kojack adds: I felt like going to Israel was obviously like we were going to the roots, when we got there, all the roots came to us. I have this vision pretty often when listening to Matisyahu, I see him standing over people and bopping them on the head with a gigantic circus type blow up hammer, or gripping the listener by the cheeks and shaking them, repeating the same thing over and over, the message is clear, the reason is real and meaningful. This is one of my favorite things about Matisyahu is that he drives the themes repeatedly, even using the same words: soul, love, fire, flame inspire, throughout each song on every album, yet it remains powerfully unique every time, his poetry is a reflection in everything. Below is a track listing, personal favorites (bold) that still stick out after over 100 listens of the album. Amidst all of this I went through quite a bit of change. Rather than trying to get into it all I will let the lyrics of the new record do the explaining…I hope you enjoy and find meaning this next batch of songs. I prefer to speak in my native language, the language of the soul, Music. Matisyahu is currently on tour with The Dirty Heads, who have previously toured together opening for Sublime with Rome in the summer of 2010, he is also featured on their track, “Dance All Night”. Check out their album as well, it’s great. See that review HERE. Jeff Possiel is a contributing writer/photographer for Music Bailout and Creator/Strategic Director of Headies Music.